I was wandering around a local antiques mall yesterday and spent a considerable amount of time chatting with an old guy asking how he got started selling antiques. I had already checked out his booth and hadn't seen anything of interest. But after about 30 minutes with him, I noticed something under a box and asked him (Fred) about it. Bingo, jackpot! 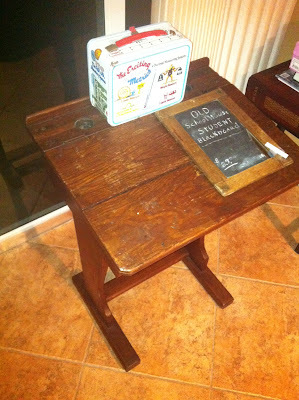 It was an old school desk which is one of the items I've been searching for over the last year. This school desk could date from anytime between the 1950s back into the 1880s. I base this on the fact that are there are two spots for inkwells, a feature that disappeared in the 60s as ballpoint pens and cartridges for fountain pens replaced traditional fountain pens that were loaded by filling them directly from ink bottles. 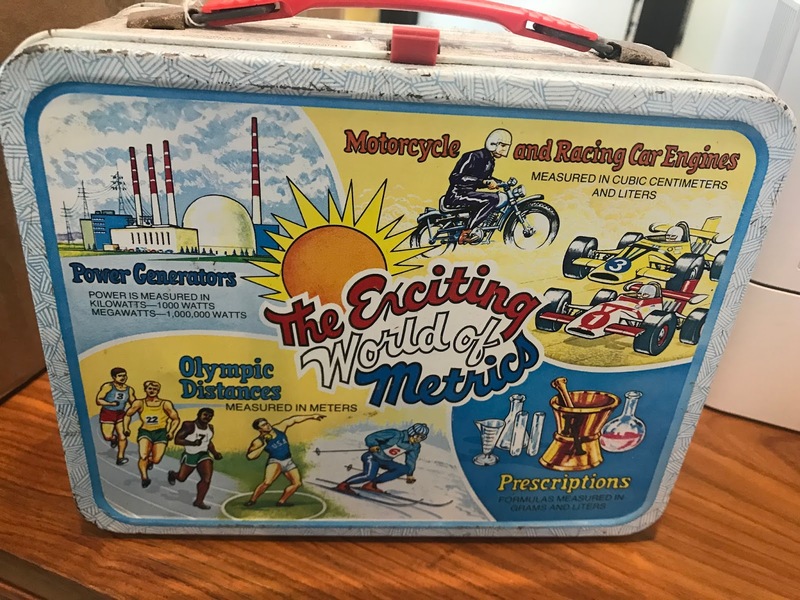 Also pictured are two other items that I found: an old blackboard that students would use at their seats and a school lunchbox talking about the US going metric. The student blackboard feels really old to me, perhaps around 1900. It was obsoleted by the introduction of reasonably price paper and pencils. 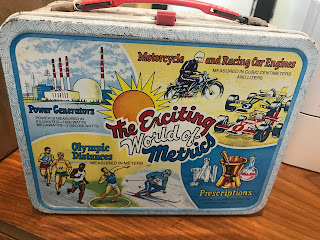 I can date the metric lunchbox without taking such wild guesses, it says right on it: "c 1976 King-Seeley Themos Company". 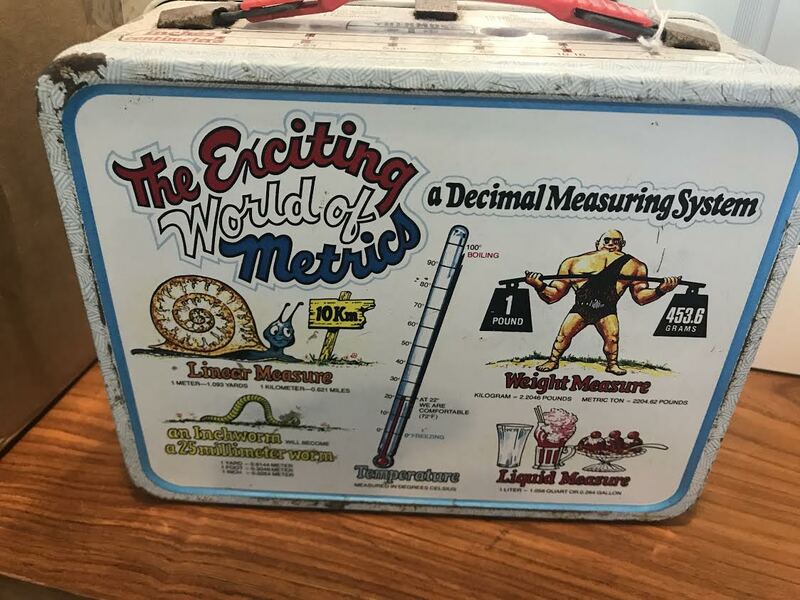 Of course, we all know that the US failed in its modernizing and internationalizing effort to move to the metric system which is one of the many disadvantages that we carry with us as our educational and economic system struggle to keep up and compete in the modern world. Not for us the celsius or centigrate system, no liters or meters or grams. Just inches, feet, miles, gallons, and pounds. We failed at it because in the short-run, it was hard. Shame on us! 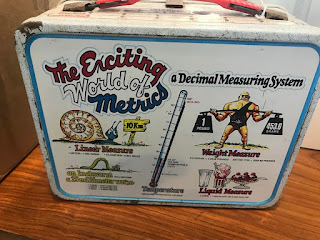 Now we are the backward company with a less efficient advantageous system and the rest of the world has the benefit and efficiency of the metric system. I think we are the only country that couldn't seem to make the shift.